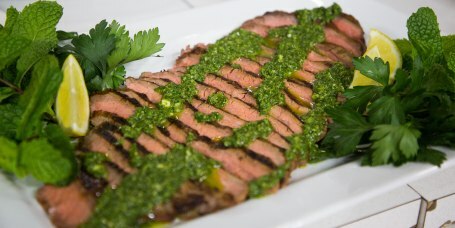 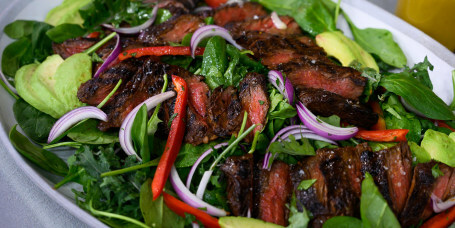 Make steak easy with Natalie's savory soy marinade and quick blender chimichurri sauce. 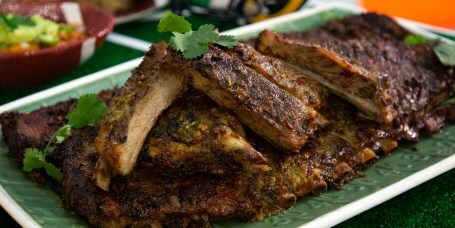 These marinated ribs prove theres no such thing as too much garlic. 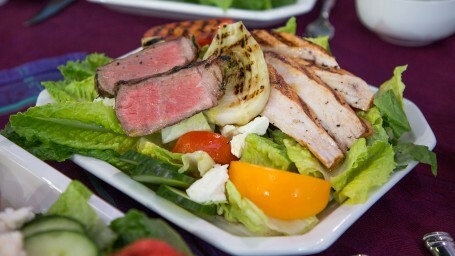 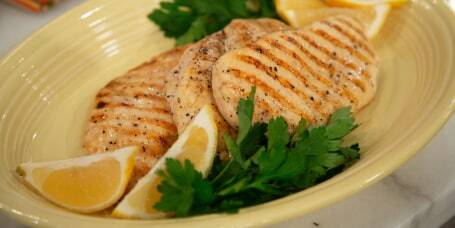 Make perfectly cooked grilled chicken breasts every time with Martina McBride's simple recipe. 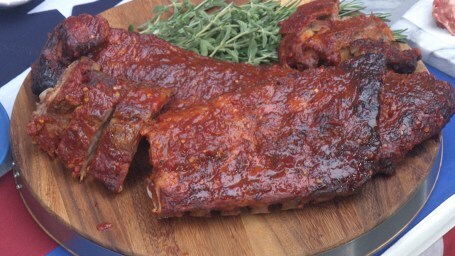 Smother tender baby back ribs with spicy homemade plum and habanero barbecue sauce. 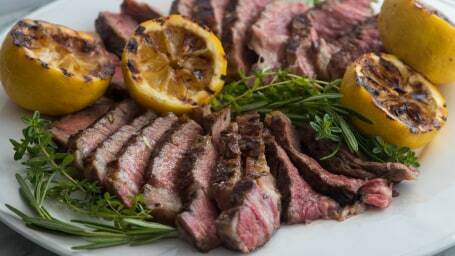 Juicy, grilled steak can be a year-round meal with the help of a grill pan and enough marinating time. 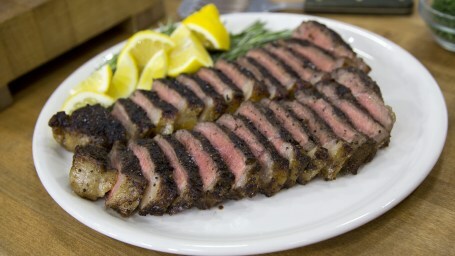 A simple, buttery glaze makes this quick and easy steak extra flavorful and perfect for busy weeknights. 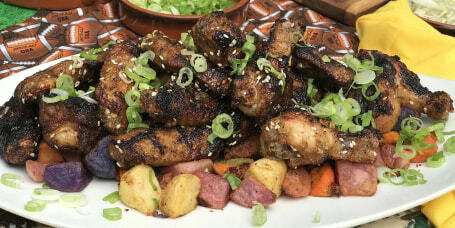 Give chicken wings an Italian makeover with tangy, sweet and sour agrodolce sauce. 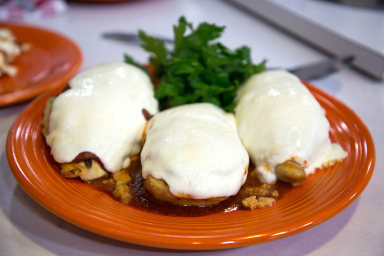 Sunny Anderson makes chicken parmesan using just 5 ingredients and without turning on the oven. 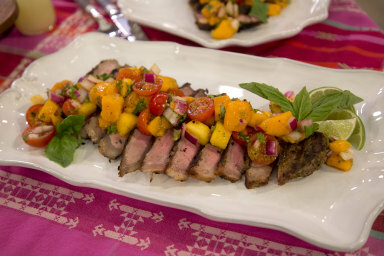 Honey-sweet mango and tangy tomatoes make for a deliciously zesty salsa that's excellent with grilled steak. 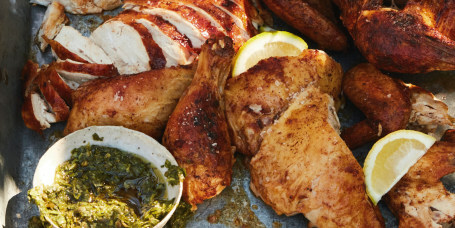 This marinade is bright, garlicky, and goes with almost any kind of meat. 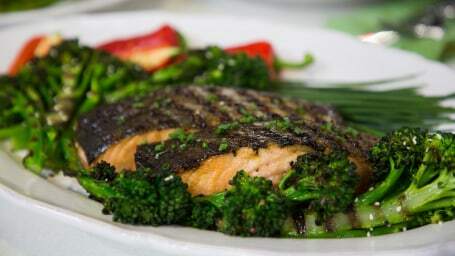 White miso, sesame oil and fresh ginger add tons of flavor to fresh salmon and broccolini before they hit the grill for a smoky finish. 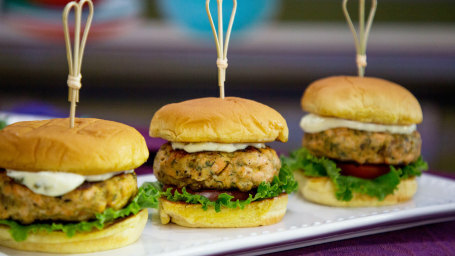 Change up your usual burger routine with fresh and healthy grilled salmon burgers topped with tangy tartar sauce. 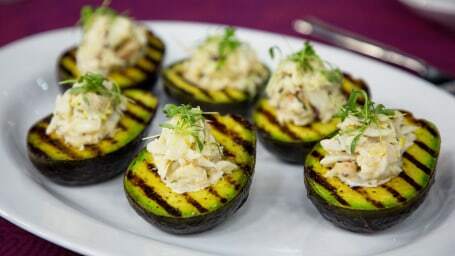 Grill avocados to add smoky flavor and increase their creaminess, then fill them with fresh crab salad for an easy and impressive appetizer. 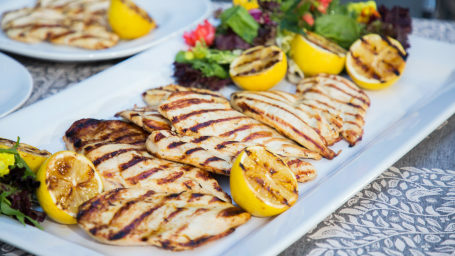 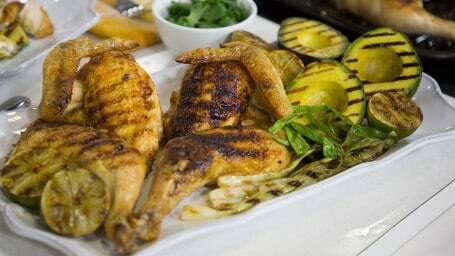 Make lemony grilled chicken for an easy and healthy cookout with just five ingredients. 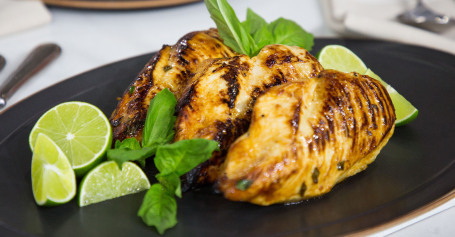 Fresh basil, garlic and lime juice make grilled chicken breasts great tasting while keeping them good for you. 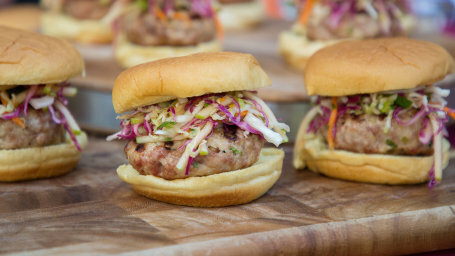 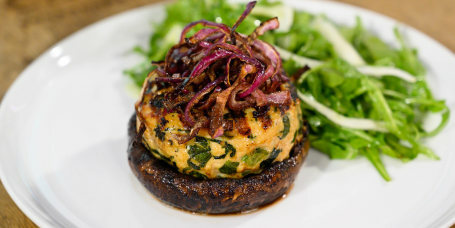 Give burgers and Asian twist with Al Roker's savory turkey and pork burgers and crunchy coleslaw. 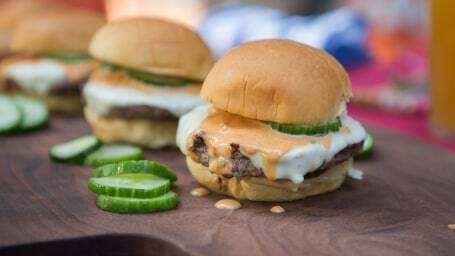 Mix up savory mustard barbecue sauce and quick homemade pickles to add a ton of flavor to grilled burgers. 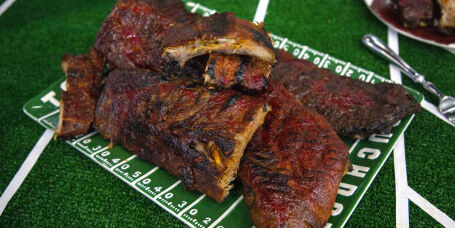 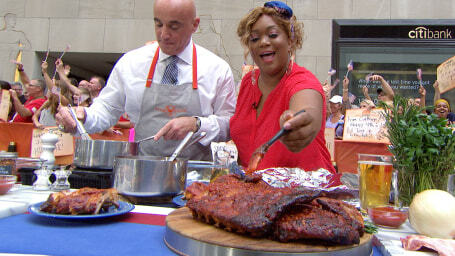 Big beefy ribs get a spicy kick from Sunny Anderson's hot, hot, hot chili glaze. 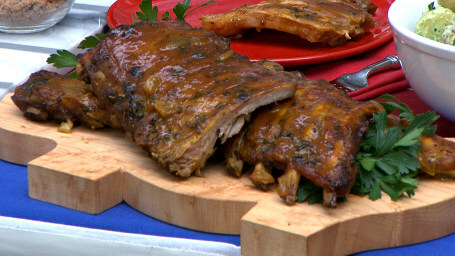 Give your cookout guests a delicious surprise with tangy mustard-glazed baby back ribs. 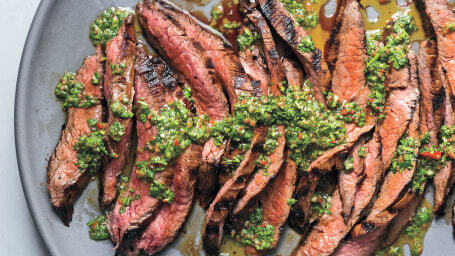 Give flame-grilled steaks an Italian touch with Calabrian chile and cippolini onion sauce. 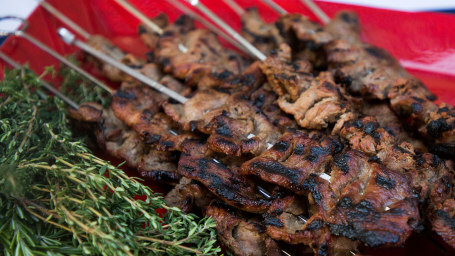 Give steak skewers a teriyaki twist with Siri daly's homemade Asian-inspired barbecue marinade. 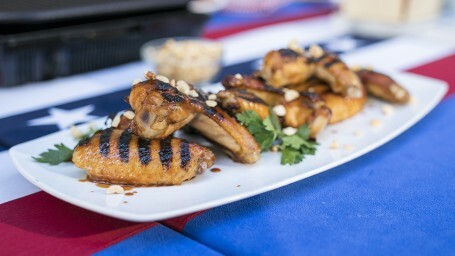 Give wings an unexpectedly twist with a sweet, savory and spicy peanut butter and jelly marinade. 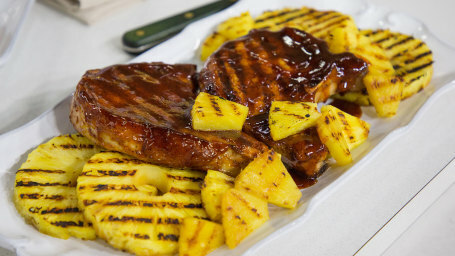 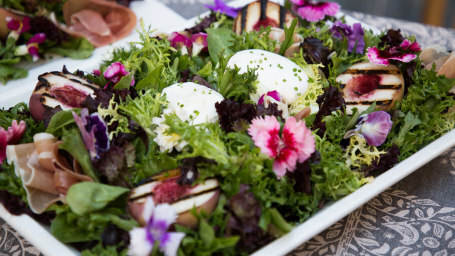 Keep your cookout light, healthy and flavorful with grilled swordfish steaks and fresh vegetables. 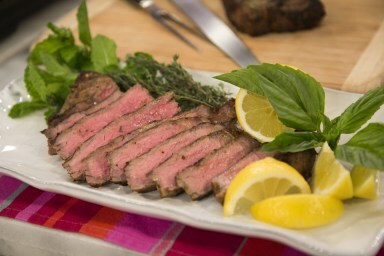 Cook up thick New York strip steaks on the grill with aromatic garlic and fresh herbs. 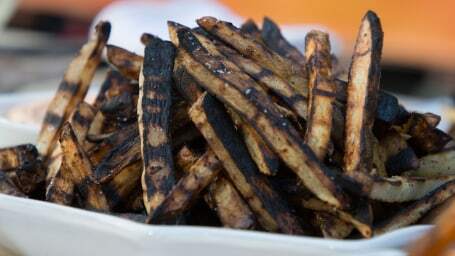 You may never go back to deep-fried potatoes again after tasting the crisp, smoky deliciousness of flame grilled french fries. 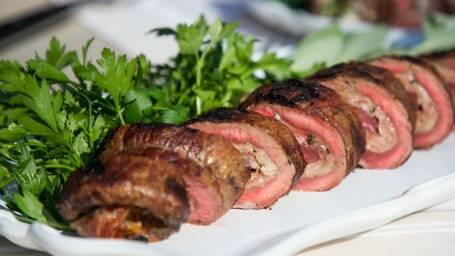 Mark Bittman's stuffed flank steak recipe takes the meat from basic to brilliant with just 4 simple ingredients. 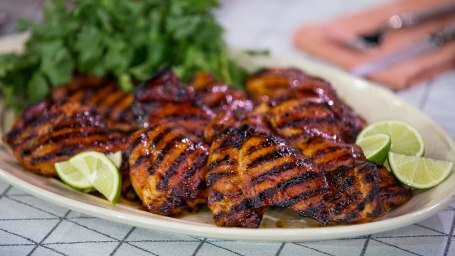 Former football star Nick Mangold takes pork chops into the end zone with his signature homemade barbecue sauce. 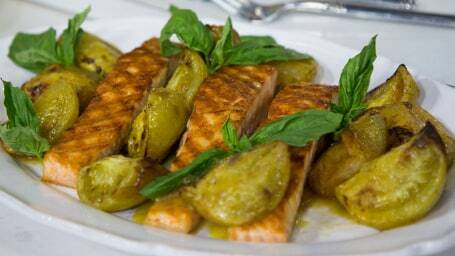 Grill up a healthy summer dinner with fresh salmon, green tomatoes, fresh herbs and zesty citrus. 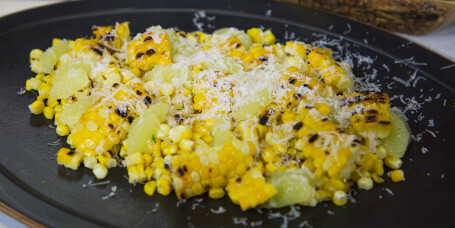 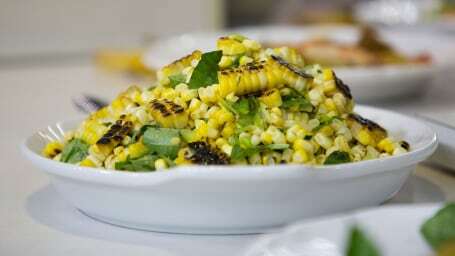 Grilled summer corn gets extra flavor from savory scallions, bright citrus and fresh basil in this easy, healthy and seasonal salad. 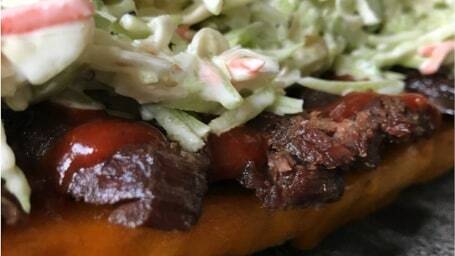 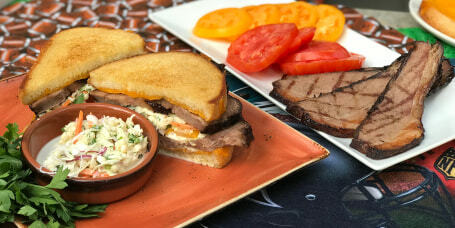 Barbecued brisket only gets better when you pair it with creamy coleslaw and serve it on a toasty bun with melty cheese. 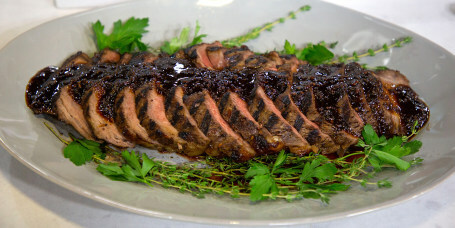 Grill up meaty, peppercorn-crusted strip steaks with a sweet and savory steak sauce for Father's Day. 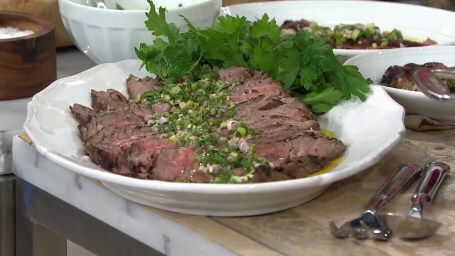 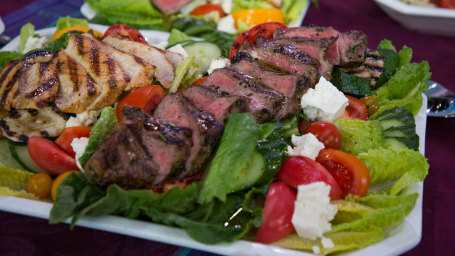 Giada adds fresh flavor to meaty steaks with a quick garlic, rosemary and lemon marinade. 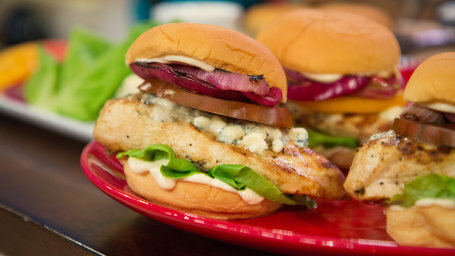 Instead of a hot dog or basic burger, try these colorful and flavorful chicken sandwiches topped with blue cheese.